Today I’m inspired by the tenacity of a little plant in my landscaping that I planted last summer, so I’m going to stray a bit from the Thankful theme and go with my inspiration. In the end there’s lots to be thankful for, so please bear with me as I tell my story. I wanted some green around the stepping stones we installed in our garden, but since they would be used daily, I didn’t want to plant anything that would grow so tall as to impede walking. 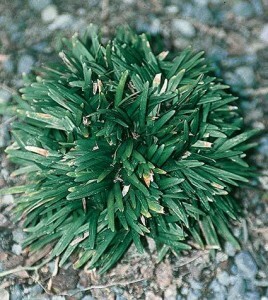 I did my research, and came up with Mondo Grass, purchased eight little containers of it at my local nursery, and planted them in summer 2008. I have to admit, I was a bit disappointed in their performance over the year. None of them grew (they’re supposed to spread and fill in areas,) and they all got yellowish tips on their blades which made them look scrubby over the winter (they’re supposed to be evergreen.) Patience is one of the requirements of being a gardener, so I decided to give my eight little lumps of grass one more year to see what they would do. I thought maybe I hadn’t planted them deep enough and figured they’d either take root over the summer, or die. On Mother’s Day this year, I brought home from the nursery several bags of mulch to put around our foundation plantings in the front and both sides of our house (that’s my gift from my husband and sons—they help me garden on Mother’s Day.) When my husband unloaded them from the car, he plopped a few bags right on top of one of my Mondo Grass lumps. I don’t think I even noticed at the time, but if I had I probably wouldn’t have done anything about it since I wasn’t expecting them to do much. We spread the mulch in the front garden but, because life is busy, never got around to doing it on the side of the house where the Mondo Grass was, so the bags of mulch stayed put. It ended up being one of those I’ll get to it next weekend sort of projects that never did get done. Over the course of this summer, with the exception of the one lump that was under the bags of mulch, the Mondo Grass did take root and looked nice and healthy. I was pleased, and figured I’d buy another lump to replace the one that the mulch bags had killed. But I was in for a surprise. When I finally got my husband to move the bags into the shed for use next summer, I was shocked to see that my poor, little, smothered lump of Mondo Grass was still alive! It was white, and looked sort of like creepy roots, but had obviously spent the summer growing toward the edge of the bags so it could get some sunlight. I am amazed and humbled by this little plant. I need to be that tenacious with my needs and, yes, my wants too. I have to ask myself, when a big bag of mulch is dropped on me, crushes me and blocks me from the sunlight I need to live, will I persevere? Will I push and push trying to get to the sunlight? I can’t say that I’ve had anything truly crushing happen to me (that’s something to be thankful for!) but if anything ever does, I will try to remember my little Mondo Grass and persevere until I either reach the sunlight, or someone lifts the bag off of me so I can be free to live and grow again. I can’t wait to see what that lump does next year! Will it thrive? Will it limp along? I suppose it could die, but whatever it does, ugly or beautiful, it will stay in my garden to remind me to be tenacious– always.